Q & A - What does "OC" stand for on a graded card? Three Bryce Harper Pins For The Price Of One - Nobody Pays Attention! I’ve been waiting for one of these to show up. 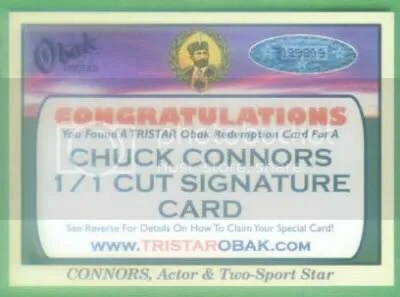 This is the first 2009 TRISTAR Obak Cut Signature to hit eBay. Its of Chuck Connors and is serial numbered 1/1. I didn’t realize that these were inserted as redemptions. I guess they did that to protect the autograph. Right now it can be yours for $200.00. I’d like to see the Lena Blackburne and Emmett Ashford signatures from this set. You don’t see many redemption cards in TRISTAR products. I wonder what their turnaround time is like?